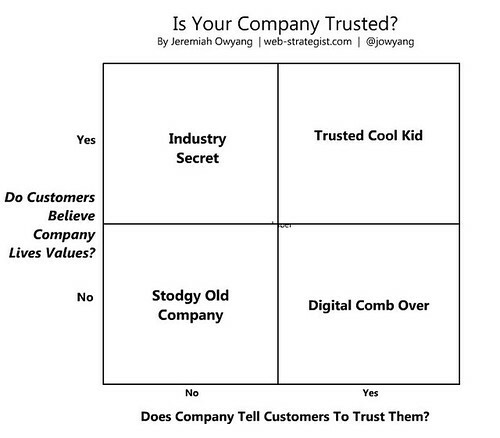 Is Your Company Trusted or Do You Have a Digital Comb Over? Many companies are entering the social/green/community space, with hopes of impressing customers, yet despite their best intentions, they could come across as inauthentic, and be damaging their own brand. Companies should first take a self-assessment of their brand to see if they’re ready before they decide to enter the social space. Is the company ready to talk about the good –and bad– with the market? Is the internal culture ready to embrace customers on their own terms? Is the culture ready to make changes based on the request of customers? Launching a corporate blog is easy, a Twitter account even easier, yet if companies culture doesn’t match the values they’re telling the market, they risk brand damage through reduced credibility. You’re not fooling anyone.